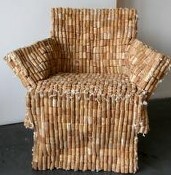 You must have a lot of wine corks! Lish wrote a Wine Cork Project Crawl last June that is always in our top searches, so I’d thought we’d revisit the topic. The little buggers must be sparking something inside crafters right now because people all over the nets are coming up with bigger and better projects for their collection. But be careful, crafting with wine corks is a little addicting. It could all start simply enough, you could construct a simple tivet or corkboard and then add a roof to that Spring birdhouse … and before you know it, you could be designing whole chairs. To match the chair, of course, you’ll need a cork baseboard. 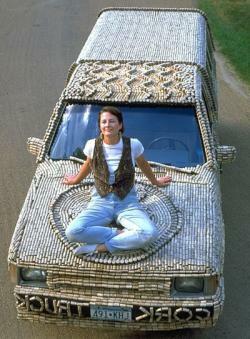 After your living room is positively overflowing with corky-ness, you might turn your attention to covering your entire truck with them. Still got more? Why not go all the way, and do what we’ve all dreamed about since we were 6 years old:* Craft an entire boat out of the suckers. That’s right, John Pollock (an Ann Arbor native, at that!) actually made an entire working boat out of a lot of wine corks. One hundred sixty five thousand, three hundred twenty-one of them to be exact. Amazing. *OK, maybe that was just me, but come on, that’s sweet! I’m looking for an easy way to cut corks in half lengthwise. does anyone have a tool or an idea of how to cut them. Any help would be appreciated. A sharp knife with a locking blade works well. A friend uses a bandsaw and he made a special ‘jig’ to secure the cork, but you can do it manually with patience. Be very careful.